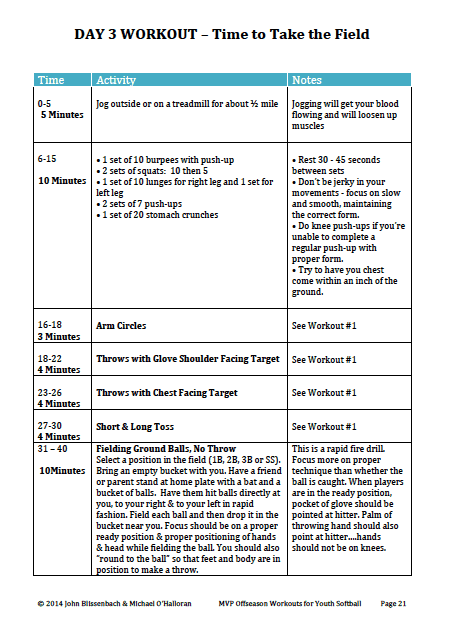 Here’s a softball training program that will prepare your players for the upcoming season like no other. Conditioning, skill development and inspirational stories. 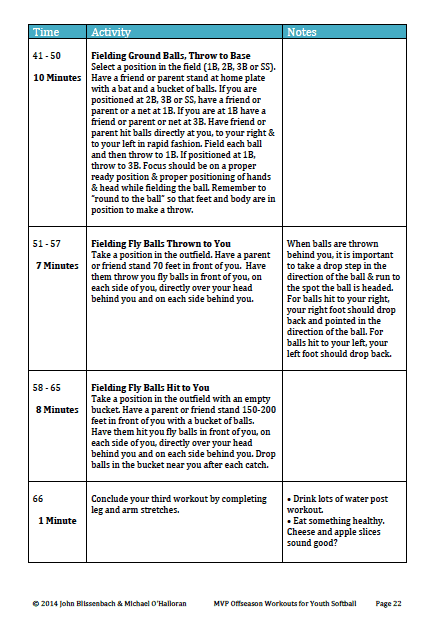 Your player can complete this softball training program from their backyard or neighborhood park. Spend less time in the car and more time on skill development. 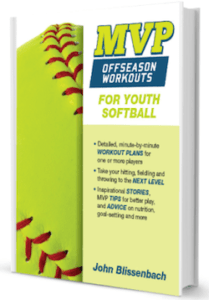 Is your daughter looking to improve their softball game during the offseason? Here’s a tool to take their hitting, fielding and throwing to the next level. 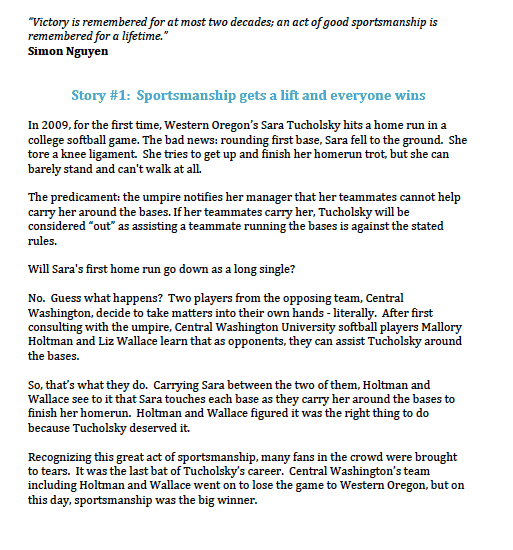 A softball inspirational story and quote for each workout. Essential info for youth softball players. Softball Training: Who is it for? Ages 10 – 17 years old. It’s recommended that players have played organized softball before. That will help with this softball training program. • Your team’s coaches don’t have enough time to devote to every individual skill. Regular season games usually present too few opportunities to hone a skill. Practices during the regular season provide more opportunities, but typically a coach has many other topics to cover. Let’s say a player wants to work on hitting pitches on the outer half of the plate to the opposite field. A player may have only see a few of these pitches during a practice or a game. However, this softball training programs features dozens of opportunities weekly to work on hitting this type of pitch. Lots of reps lead to improvement. • Breaking down the bigger game into each of the individual components makes it easier. If a player just goes to practices and plays games; that player will likely get better at softball. If that same player takes a different approach, putting a concentrated effort into improving some of the fundamental softball skills, it’s likely that the player will improve at a much more rapid pace. • A focus on fundamentals. We placed an emphasis on building blocks of what makes up a good softball player because that easily transfers from one team to the next. • Strong emphasis on throwing, fielding and hitting. These are 3 critical areas that can be practiced individually or with another person in an effective manner and the offseason is a great time period to work on these skills. • Multiple position development. Youth softball players shouldn’t just learn the skills for just one position. The best players are well rounded. They know how to play many positions. This makes them a valuable asset to any team. • A fitness focus. Players play their best when they’re in shape. It’s hard to execute at the highest level if you’re tired, lack strength or are just out of shape. To address these needs, a part of each workout session includes general fitness exercises. • Designed for healthy kids who have played softball before. If you have any concerns about having your child participate in this type of program from a health perspective, consult with your physician. Kids should have a water bottle and drink water as needed. John Blissenbach has coached all levels of youth softball and baseball from kindergarten through high school. He has coached and managed championship youth & American Legion baseball teams. He began coaching baseball in 1979 at the age of 20. John started as a high school assistant varsity/JV head coach working with varsity head coach Hank Mauer (great uncle of Minnesota Twins All-Star Catcher: Joe Mauer). In addition to coaching softball, John has also been a coach for his 4 children’s softball, football, basketball, track and soccer teams. During the past 20 years he has had the great pleasure of coaching more than 50 youth (boys & girls) teams. An inspirational story for players to read start each session. Here’s an example.